Acetic acid, also known as ethanoic acid, is an organic chemical compound best recognized for giving vinegar its sour taste and pungent smell. It is one of the simplest carboxylic acids and has the chemical formula CH3COOH. This acid is an important chemical reagent and industrial chemical useful for the production of various synthetic fibers and other polymeric materials. These polymers include polyethylene terephthalate, used mainly in soft drink bottles; cellulose acetate, used mainly for photographic film; and polyvinyl acetate, for wood glue. In households, diluted acetic acid is often used in descaling agents. The food industry uses it (under the food additive code E260) as an acidity regulator. 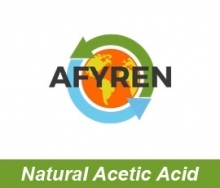 AFYREN produce a 100% biobased Natural Acetic Acid with a respectful process for environment and non GMO natural microorganisms. The raw materiels used are also non GMO. Fermentation residue can return to the earth and are recoverable as amendments and organic fertilizers. AFYREN technology tends to "zero waste", and the obtained products are COSMOS and ECORCERT approved.